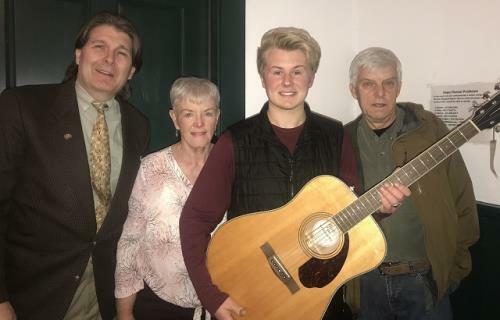 Share America Foundation, Inc. president Randall Franks presented a new acoustic Fender Paramount to youth musician Logan Puryear, 17 of Soddy Daisy, at the Ringgold Opry. The guitar, valued at $900, was donated by Joey Chamberlain in honor of the Apison Lions Club. Mr. Franks and Mr. Puryear were joined by Frankie Hood of Ringgold, who stood in for Mr. Chamberlain who now lives in Oklahoma, and Ronal Graham, Ringgold Opry organizer. Mr. Puryear performed with Mr. Franks on the Ringgold Depot stage sharing the guitar classic "Wildwood Flower."